Osso Buco is a dish from Milan, Italy (beautiful place!) of braised veal shanks. The veal is usually sprinkled with gremolata, a mix of parsley, garlic and lemon zest and served with risotto alla milanese, a risotto enhanced with saffron threads. 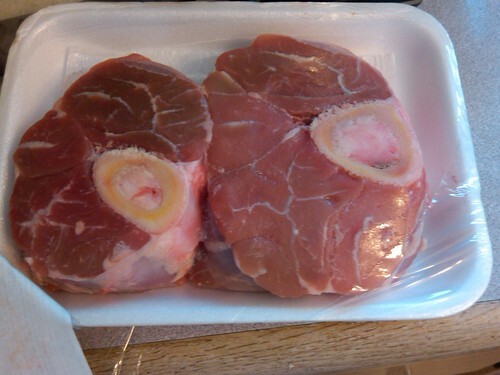 Osso Bucco means “hole bone” because the marrow is part of the dish’s appeal. The restaurant that, in my opinion, has the best Osso Buco is DaSilvano in NYC- I was blown away by it. And this dish is by far one of my favorite traditional Italian dishes that doesn’t involve pasta! This can also be prepared in a dutch oven- same method, except put everything back into the dutch oven/pot instead of transfering to the slow cooker then cook in the oven at 325 for about 1-1 1/2 hrs. Heat a tablespoon of olive oil in a large pot on the stove top over medium heat for about five minutes. Add pancetta to pan and cook, stirring ocassionally. When the pancetta is crispy and most of the fat is rendered (about 5 min of cooking), remove pancetta to a plate covered in some paper towel and set aside. If necessary, drain all but 2 tablespoons of the rendered fat. 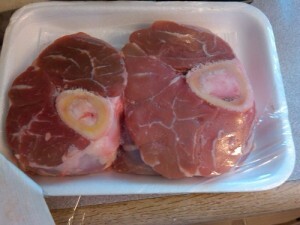 Season the veal shanks well with salt and pepper. 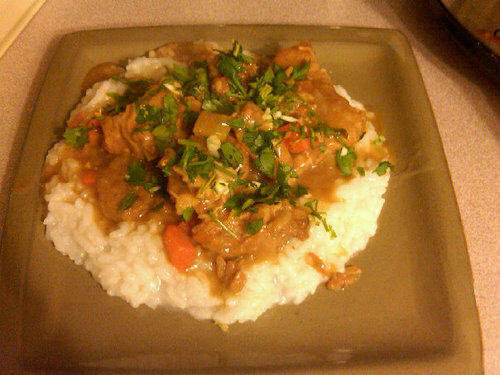 Dredge the veal shanks through some flour, shake off any excess, and add the meat to the hot fat in the pot. Increase the heat to medium high and cook the meat on each side until well browned (about 5 minutes per side). Remove shanks to a plate, set aside. Add the vegetables to the slow cooker then top with the shanks and the pancetta. 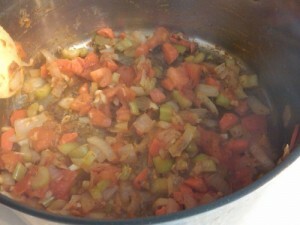 Pour in the wine, and then add enough stock to come a little more than half way up the side of the shanks. Cover and cook on high for about 6-8 hours. Combine the gremolata ingredients, place in a separate small serving dish. Serves 4 to 6, depending on how many shanks you have, one shank per person. Serve on top of risotto or polenta (for low carb version, if you dare, skip the risotto or polenta). 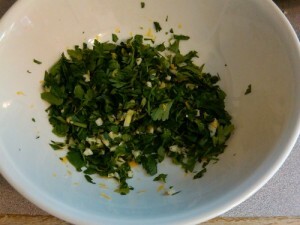 Sprinkle with gremolata.